An Application in BPC system is defined as multidimensional data model used in EPM. Few examples of Applications are – Operation, Legal or Finance team. There are two types of applications in BPC system – Reporting and Non-Reporting. Reporting applications are used for analysis purpose and you can pass inputs from the users. Non-Reporting applications are used to contain reference data like currency rates, carry forward balances, etc. An Appset consists of one or multiple applications in system. Each application consists of the master data for an application, which is used to control data in the application set. An application can also share one or multiple dimensions with other applications. Each Reporting application consists of a dimension, properties to hold the additional information, and dimension members. Consider a Consolidation Rate application, which consists of Rate app to store currency exchange rates and an Owner application, which stores the relationship between Owner company and its subsidiary companies. To add an application to the Application set, you can use an existing application by selecting reference applications and any set of business rules. You can also add dimensions in new application and these can be defined as secure or non-secure. When you define dimensions as secure it ensures the read and write access is controlled through user profiles. To create a Consolidation application, you need to define AppSet for consolidation and dimension set for consolidation. You should set the following parameters after creating the application set. In SAP BPC NetWeaver version, all these parameters are maintained in ABAP DDIC table. 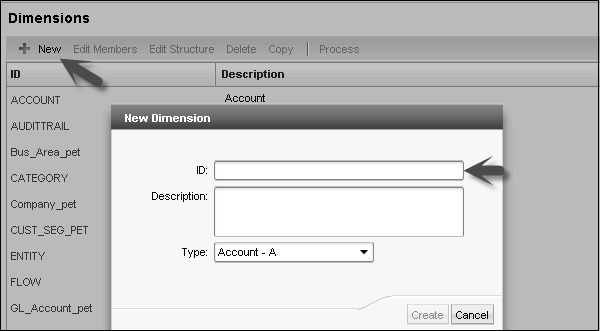 Once the application set is created, the next step is to set up the parameters for Dimension set. You can add a new dimension or copy an existing dimension. In the Administration Console, go to Dimension and Model. Go to Dimensions and Models → Dimension. IntCo (I) − It determines the level of entity hierarchy at which level the elimination needs to be performed. R_Acct (A) − For maintaining different types of Rate. InputCurrency(R) − Currency Type Dimension. R_Entity (E) − Rate application. IntCo (I) − It determines level of the entity hierarchy at which level the elimination needs to be performed. Groups (R) − Used to implement separate group type. To set up a consolidation application, three applications are required – Rate, Ownership, and Consolidation.